What do you love most about your studio? I love all of the lighting available in just that one room – from the natural lighting offered by the floor-to-ceiling windows to the spot lighting from my can lights and the romantic whimsy from the strands of white lights around my windows. I also love the expanse of space I have to work in; sometimes I have two sewing machines going at the same time or when I pull out my collage bins, oftentimes it takes two tabletops to hold everything I am working with! 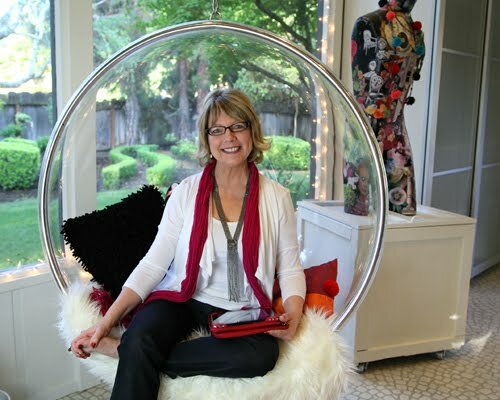 And of course I love my bubble chair, where I can sit and dream up project ideas, sketch or hop on my iPad and brainstorm in one cozy little spot … I love that I can spin around and look at the garden outside or my creative space inside for inspiration. When you’re not creating for iLoveToCreate, what kind of art do you love to make for yourself? I have a fetish for mannequins! When you navigate through my home, you’ll see mannequin parts everywhere that I’ve altered into art. I also love mixed media (you have to be somewhat of a hoarder to be able to do mixed media) and I love using this art form to transform mannequins, jewelry and canvases into art. My altered mixed-media art shoes and jewelry are also among my very favorite things to create. Read more about Pattie’s feature with STUDIOS magazine on her Pattiewack blog. For more information about Pattie’s artistic career, check out her feature on iLoveToCreate.com. 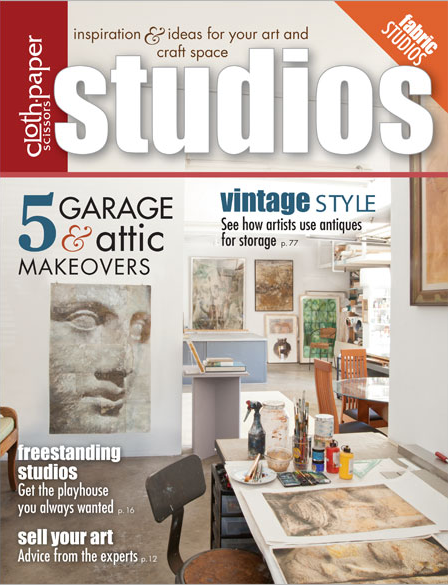 Pick up a copy of STUDIOS magazine at your local bookseller or by following this link to purchase it online.